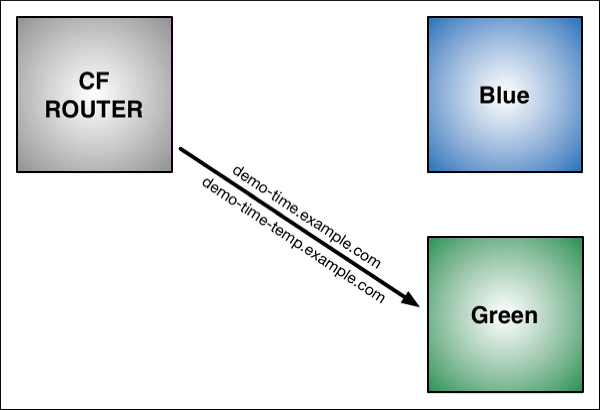 Blue-green deployment is a technique that reduces downtime and risk by running two identical production environments called Blue and Green. At any time, only one of the environments is live, with the live environment serving all production traffic. For this example, Blue is currently live and Green is idle. As you prepare a new version of your software, deployment and the final stage of testing takes place in the environment that is not live: in this example, Green. Once you have deployed and fully tested the software in Green, you switch the router so all incoming requests now go to Green instead of Blue. Green is now live, and Blue is idle. This technique can eliminate downtime due to app deployment. In addition, blue-green deployment reduces risk: if something unexpected happens with your new version on Green, you can immediately roll back to the last version by switching back to Blue. Note: If your app uses a relational database, blue-green deployment can lead to discrepancies between your Green and Blue databases during an update. To maximize data integrity, configure a single database for backward and forward compatibility. Note: You can adjust the route mapping pattern to display a static maintenance page during a maintenance window for time-consuming tasks, such as migrating a database. In this scenario, the router switches all incoming requests from Blue to Maintenance to Green. For this example, we’ll start with a simple app: “demo-time.” This app is a web page that displays the words “Blue time” and the date/time on the server. Blue is now running on Cloud Foundry. The CF Router sends all traffic for demo-time.example.com traffic to Blue. Two instances of our app are now running on Cloud Foundry: the original Blue and the updated Green. The CF Router continues sending all traffic for demo-time.example.com to Blue. The router now also sends any traffic for demo-time-temp.example.com to Green. Now that both apps are up and running, switch the router so all incoming requests go to the Green app and the Blue app. Do this by mapping the original URL route (demo-time.example.com) to the Green app using the cf map-route command. The CF Router continues sending traffic for demo-time-temp.example.com to Green. Within a few seconds, the CF Router begins load balancing traffic for demo-time.example.com between Blue and Green. You can now use cf unmap-route to remove the route demo-time-temp.example.com from Green. The route can be deleted using cf delete-route or reserved for later use. You can also decommission Blue, or keep it in case you need to roll back your changes. BlueGreenDeploy: cf-blue-green-deploy is a plugin, written in Go, for the Cloud Foundry Command Line Interface (cf CLI) that automates a few steps involved in zero-downtime deploys.